The Confederation of African Football (CAF) has lifted the provisional suspension of FIFA referee Janny Sikazwe who was accused of corruption in November last year. And Football Association of Zambia (FAZ) president, Andrew Kamanga is saddened by the passing on of former U-20 National team coach, Hector Chilombo. 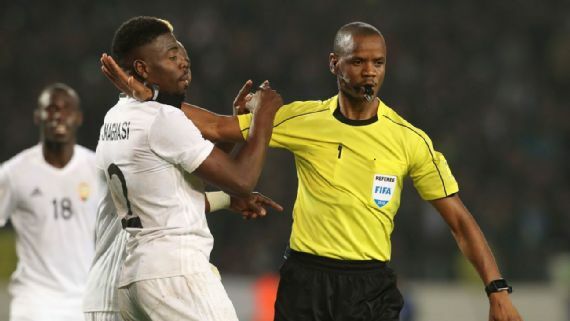 The Zambian referee has been handed a reprieve by the CAF Disciplinary Committee after the body sat to review his case. According to the CAF-website monitored by ZNBC Sport, the disciplinary body has decided that there was no sufficient evidence to implicate Sikazwe regarding the allegations of corruption made against him. Sikazwe was suspended following corruption allegations raised by Angolan outfit Primeiro de Agosto in their 2018 CAF Champions League semi-final match with eventual champions Esperance de Tunis. Sikazwe officiated at the FIFA World Cup in Russia in 2018 making history as he became the first Zambian to achieve that feat. But when contacted for a comment Football Association of Zambia Communications manager Desmond Katongo said the association would not comment until they receive communication of the decision from the continental body. And in a statement Katongo stated that Kamanga mourned Chilombo saying he would be greatly remembered for his services to the nation as a player and coach. “Chilombo served as Under-20 National Team Coach in 2015 when Zambia qualified for the AFCON in Senegal,” said Kamanga. Kamanga stated that Chilombo had been at the helm of various local clubs among them Nchanga Rangers, Power Dynamos, Napsa Stars, Lumwana Radiants, Chilanga Heroes and Zanaco. Chilombo died around 04 hours this morning at UTH, where he was rushed to after collapsing on Saturday.